We prove a general upper bound on the tradeoff between time and space that suffices for the reversible simulation of irreversible computation. Previously, only simulations using exponential time or quadratic space were known. The tradeoff shows for the first time that we can simultaneously achieve subexponential time and subquadratic space. The boundary values are the exponential time with hardly any extra space required by the Lange-McKenzie-Tapp method and the (log 3)th power time with square space required by the Bennett method. We also give the first general lower bound on the extra storage space required by general reversible simulation. This lower bound is optimal in that it is achieved by some reversible simulations. All authors are partially supported by the EU fifth framework project QAIP, IST1999-11234, the NoE QUIPROCONE IST-1999-29064, the ESF QiT Programmme, and the EU Fourth Framework BRA NeuroCOLT II Working Group EP 27150. Buhrman and Vitényi are also affiliated with the University of Amsterdam. Tromp is also affiliated with Bioinformatics Solutions, Waterloo, N2L 3G1 Ontario, Canada. 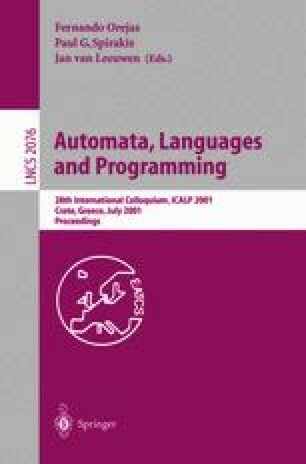 M. Frank, T. Knight, and N. Margolus, Reversibility in optimally scalable computer architectures, Manuscript, MIT-LCS, 1997 //http://www.ai.mit.edu/~mpf/publications.html. M.P. Frank and M.J. Ammer, Separations of reversible and irreversible space-time complexity classes, Submitted. //http://www.ai.mit.edu/~mpf/rc/memos/M06_oracle.html.